Sometimes when I watch a movie, I often wish that the characters were real, and if a movie is done well, the characters are real. For those 2+ hours, they live and breathe and take up space in your subconscious. Simply put, they exist. Many times, I wish I actually knew them, that they were my friends in real life! Below are just a few “movie pals” that I wish were real. Chris was the ultimate friend; fiercely loyal, honest, and flawed. You know he’d have your back in a fight and even if it scared the heck out of him, he’d go into battle with you. Once you earned his trust you know you had a friend for life. He was the type of guy that commanded respect without asking for it and yet he was also sensitive and insightful. What better friend than a guy who could get you things. Red was the ultimate bunkmate (although technically him and Andy never shared a cell) mostly because he was quiet. Red is the type to quietly observe the crowd, forming his silent (and very accurate) judgements and only befriending those who are worthy of his friendship. By acquiring the rock hammer for Andy, he unknowingly became his accomplice in his great escape… but more importantly he saved Andy’s life – his friendship offered hope. Imagine having a zany, older, brilliant scientist as your best friend! Such was the good fortune of Marty McFly. He friendship with the doc allowed him to time travel, ride a hoverboard (why don’t these exist yet?? ), see and alternate version of how his life could have turned out, and be a part of the wild west! 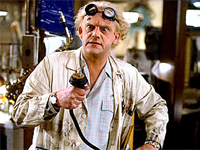 Writing this now, I think Doc Brown is my number one pick for my new BFF! Just imagine that the one goal of all your friends was to get you laid. Nuff said!